Nominated for four 1997 VFX HQ Awards: Best Visual Effects, Best Sequence (Cab Chase), Best Models/Miniatures and Best Compositing. Mark Stetson talks about Super35 and THE FIFTH ELEMENT in Spotlight. Mark Stetson, formerly with Stetson Visual Services, makes his Digital Domain supervisory debut in THE FIFTH ELEMENT, a visual extravaganza of color and texture. The visual effects for Luc Besson's film are stunning. Stetson's name deservingly appears in the title sequence, as it was a terribly huge assignment organizing the effects for this film. Interestingly enough, Stetson's title was "Special Effects Supervisor," a misnomer, since the term "special effects", in the strictest sense, refers to the art of on-set pyrotechnics and effects. The film, set 250 years in the future contained over 200 visual effects shots depicting the futuristic New York skyline, numerous space sequences, a 2000 foot long pleasure cruiser, and various transformation effects. The New York skyline shots are breathtaking. The buildings seem to soar into the stratosphere, while the tiny areas between buildings are jammed with flying cars. Depending on the motion of the cars within the frame, the cars were created both as motion-control models and CGI versions. On the CGI side, Side Effects' Prisms software was used heavily, along with the renderer Renderman. The CG cars look and move fluidly and gracefully. Careful attention to detail make these sequences shine. The extensive previsualization stage was extremely helpful in allowing artists, digital effects supervisor Karen Goulekas, and director Besson plan and execute the highly detailed sequences. Complicating the issue even further was the locations--first unit shooting took place at London's Pinewood Studios, while miniatures and CG elements were being created, shot and animated at Digital Domain in Venice, California. Some of the most amazing skyline shots occur as Leelo, portrayed by Jovovich, sees the skyline for the first time. The shot is from her point of view--the camera swings all over the place, and is absolutely breathtaking. Many of these dazzling shots of New York City in the year 2259 utilize a number of traditional techniques and highly advanced digital techniques. The cityscapes of New York are comprised of both 1/24 scale miniatures and fully computer generated buildings, depending on the shot. Similarly, the flying car elements, dependent on the motion of the cars, were realized via models and CG techniques. Digital matte paintings and layers of 2D smoke and lighting effects help complete each shot. Other memorable visual effects shots include the regeneration sequence, where Leeloo is created. A sophisticated machine builds her skeleton, and straps muscle tissue onto the bones. This amazing scene was created with CG animation, using Softimage software. The drooping cords of muscle were animated with subtle movements that work very well and help sell the shot. Prominent in the film is Evil, a huge ball of fire that threatens the Earth. The surface of Evil is a mesmerizing and constantly changing combination of fire, lava and crust. A variety of software packages were used to create the computer generated Evil. 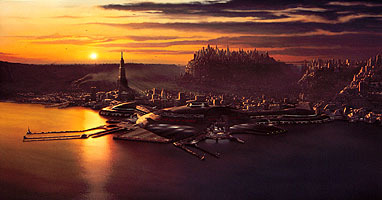 The action turns to the Fhlotsin Paradise, a 2000 foot long luxury cruise ship that sails above an all-water planet. The ship was constructed as a six foot motion control model, and was composited into the frame along with completely digital water, courtesy of Arete software. Unfortunately, the water seems a bit too synthetic in one shot. However, the compositing of the Paradise sequences are top notch. Interiors of the Paradise contained many window shots, all of which necessitated a 2D digital matte painting to depict the outside world, which had to be tracked and matched to the original camera movement. A bomb is placed on the luxury liner, forcing the heroes to flee the ship. In a series of cool shots, passengers launch their escape pods, which are tiny ships that are attached to the hull of the Paradise. When the bomb goes off, the Paradise becomes engulfed by an enormous explosion, which looked really fantastic. I was hoping for more shots of the ship's destruction, but the one explosion shot is really nice. There are plenty of other effects sequences, including dazzling transformation shots of the enemy aliens, set extensions and numerous bluescreen mattes, the landing of an enormous spacecraft in the middle of Egypt, and the light show created by the coming together of all five elements, among others. A mesmerizing, yet easy to miss shot appears early in the film, as Zorg (Gary Oldman) is demonstrating a new weapon--a huge gun goes through a complex series of transformations, and in that same shot, Zorg walks over and picks it up. I'm not quite sure how this shot was executed, but the results are stunning. This film represents Digital Domain's biggest visual effects effort in their young history. It also is a rousing success for the company--the effects are absolutely brilliant, and not only stand well on their own, but fit quite nicely into Besson's film. Check out American Cinematographer May '97.